For replacing or adding plugs to telephone line cords. Quickly repair damage connectors and cable. Simple crimp on installation. Use with tool 7667934. A 2-in-1 modular adapter is plugged into an existing phone jack and converts it to two jacks. One phone jack can then be used to connect up to two phone devices. Ex. phone and fax. Surface mount phone jacks allow you to add a phone outlet to any room. Easy to connect to a line cord for a quick installation of a new phone jack. Extends the reach of a phone cord without cutting or splicing. White. Telephone modular wall outlet. Can be used for a two line system. Good for phone, fax or modem. Mount to electrical box or flush mount to drywall. Telephone modular wall outlet. Can be used for a two line system. Good for phone, fax or modem. Mount to electrical box or flush mount to drywall. Telephone modular wall outlet. Can be used for a two line system. Good for phone, fax or modem. Mount to electrical box or flush mount to drywall. Telephone modular wall outlet. Can be used for a two line system. Good for phone, fax or modem. Mount to electrical box or flush mount to drywall. Connects two phone devices together. Connect a phone to a wall phone or surface mount jack. White jacket. Extends the reach of your telephone line. White. 25 ft. Replaces old handset cord that is twisted or making poor connections. Replace worn cords. Simply plug it into the phone and handset jack to install a new cord. 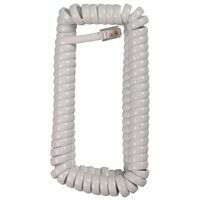 Replaces old handset cord that is twisted or making poor connections. Replace worn cords. Simply plug it into the phone and handset jack to install a new cord. Line DSL Filter, White 50ft /15.2M Micro thin Phone Cord White. Extra Flexible cord. Discreet. Hide under carpet or behind baseboard. Cord ends terminated with phone plugs. Connects phone or modem to a phone outlet. Large holder, clip or hang onto workbelts, web suspenders, pants, etc. Holds most brand of large cell phones. Heavy duty clip on back and padded inside to protect cell phone. Elastic side pockets for pens, pencils and small tools. Connects two phone devices together. Connect a phone to a wall phone or surface mount jack. White jacket. Charge and power your USB devices wqhile you drive. Indicates when device is properly charged. Desktop telephone. Ringer volume control. Mute, redial and pause buttons. Desk / wall.